Welcome to my website, being updated in April 2019. It was created by my wife Linda, and but for her ongoing efforts it would not be here. Linda and I married in 2010 and in 2012 we moved back to my home town of Troon, on the Ayrshire coast, where Linda used to come for holidays and weekends. I have been a full-time writer since October 1970, as well as a researcher, speaker, broadcaster, editor, critic, tutor, and other aspects of the written, sung and spoken word. As of August 2018 I’ve published 9 books, most recently The Elements of Time , and a paperback edition of Starfield. I’ve contributed to another 34 books, and published 38 stories and nearly 1500 articles. 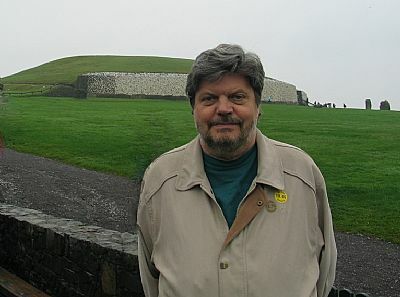 My main field is astronomy and spaceflight, I also write science fiction, and I have a broad range of other interests, particularly ancient and mediaeval history and folk music. I grew up in Troon, went to Glasgow University, and I ran folk clubs in Ayrshire for 16 years before moving to Glasgow for 30 years, returning to Troon in 2012. I was an office-bearer of ASTRA, then Scotland’s national spaceflight society, from 1962 to 2011; I was a curator of Airdrie Public Observatory off and on for 18½ years between 1980 and 2008; I was Manager of the Glasgow Parks Astronomy Project, on which I designed and built the first astronomically aligned stone circle in the UK for 3500 years, and of the North Lanarkshire Astronomy Project, which did major work in schools between 2006 and 2009. If you want to know more about any of that, it’s in my Bio and Published Work. I’m now Treasurer and Past Chairman of the educational charity ACTA SCIO, which Linda and I founded in 2011, and Past Chairman of the Astronomers of the Future Club, which we founded in Glasgow in 2011 and restarted in Troon in 2014. In 2016-17 Gerry Cassidy and I produced the first four issues of Space and Scotland magazine for ACTA SCIO, financed by another Scottish charity. The magazine proved very popular, and we’re seeking finding to resume publication. As a writer I’m often asked if I write under my own name (in my field, it would be pretty silly not to), or if the name I write under is really my own. Lunan is in fact a good old Scots name, and our family of Lunans have an interesting history, dating back to the 14th century, when an ancestor bought ‘the lands of Lunaine’ in Aberdeen. He was an illegitimate son of Robert II of Scotland, and his ancestry can be traced back through Robert the Bruce to Fergus I, king of Scots in 500 BC, also to Alfred the Great and other interesting characters. My mother’s background as a Fortescue is equally distinguished, dating back to the Barons le Fort who were kings of Paris in the 9th and 10th centuries, but others have researched and published the Fortescue history so thoroughly that I don’t need to. Topics are organised here under the titles of the books that they relate to, so if you’re looking for my work on the Search for Extraterrestrial Intelligence, you’ll find it under “Man and the Stars” and “Children from the Sky”; the Waverider spacecraft and Project Starseed are under “Man and the Planets”; “Incoming Asteroid!” speaks for itself; and for the big idea that underlies them all, this link will take you to the latest version of ‘The Politics of Survival’. The story of the Sighthill stone circle to 2012 is told in The Stones and the Stars. The circle has now been removed for housing development in the former Sighthill Park, but in response to a successful petition with over 6500 signatures, a new site has been created for it and the stones were re-rected in March 2019 - see Stone Circle recreated. ‘The Sky Above You’ covers my regular astronomy articles, broadcasts and courses available. The ‘Science Fiction’ heading gives you the background to my two SF books and my involvement in SF books and in the Jeff Hawke Club (www.jeffhawkeclub.co.uk), among other topics; among all that, I hope you find something of interest. If you would like a talk on any of it, “Talks and Events” page gives the list that I currently have available. I now have agreement with Other Side Books for publication of two collections of my space travel stories, beginning with “From the Moon to the Stars”, to be published on July 25th 2019 to mark the 50th anniversary of the Apollo 11 Moon landing. Other books currently on the horizon include the long-awaited sequel to “Man and the Stars”, a new Solar System book updating “New Worlds for Old” and “Man and the Planets”, “Waverider, a Spacecraft in Waiting”, and book versions of my notes on Jeff Hawke and Lance McLane which have been published over the last 15 years of Jeff Hawke’s Cosmos. Synopses of all of these are available and enquiries from interested publishers will be dealt with promptly and enthusiastically. If you are looking for the supposed "Black Knight" satellite, about which I am misquoted on a great many websites, you will find the facts under Black Knight and the fuller context under Man and the Stars. 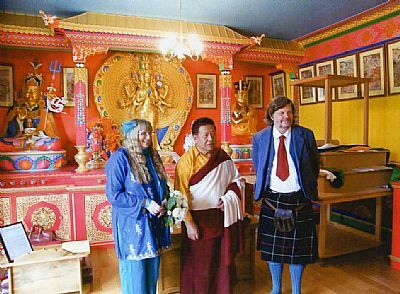 Above is a picture of Duncan and Linda with (late) Akong Tulku Rinpoche on the day of their wedding in the Chenrezig shrine room at Samye Ling on the 20th April 2010.